Start off your visit on the 25th (Thu): go on a hair-raising tour with a ghost and vampire tour, take in the spiritual surroundings of Cathedral of St. John the Baptist, then get some thrills out on the water with a waterskiing or jet-skiing adventure, and finally identify plant and animal life at Wildlife Areas. 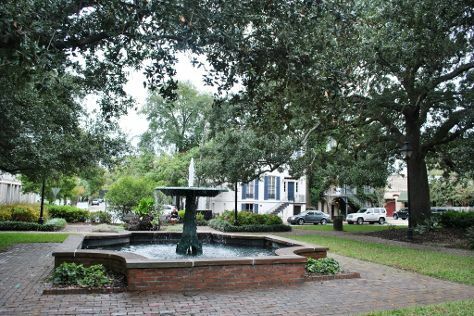 On your second day here, shop like a local with Savannah Historic District, tour the pleasant surroundings at Forsyth Park, then explore the different monuments and memorials at Bonaventure Cemetery, then take in the spiritual surroundings of Second African Baptist Church, and finally make a trip to River Street Savannah. For more things to do, ratings, reviews, and other tourist information, read Savannah trip planner . Use the Route module to see travel options from your home to Savannah. Expect a daytime high around 91°F in July, and nighttime lows around 74°F. Wrap up your sightseeing on the 26th (Fri) to allow time to drive to Myrtle Beach. Myrtle Beach is a coastal city on the east coast of the United States in Horry County, South Carolina. Start off your visit on the 27th (Sat): take a stroll through Broadway at the Beach, then stop by Bijuju, then admire nature's wide array of creatures at Ripley's Aquarium of Myrtle Beach, and finally make a trip to Myrtle Beach SkyWheel. On the 28th (Sun), you'll have a packed day of sightseeing: get a dose of the wild on a nature and wildlife tour and then kick back and relax at Myrtle Beach. To see ratings, more things to do, where to stay, and more tourist information, you can read our Myrtle Beach trip itinerary builder app . Traveling by car from Savannah to Myrtle Beach takes 4.5 hours. Alternatively, you can fly; or take a bus. Expect a daytime high around 88°F in July, and nighttime lows around 75°F. Finish your sightseeing early on the 28th (Sun) so you can drive back home.